“Coaching means side-by-side planning and working together with the same end goal in mind – Learning!” says Dr. Dawn Wilson, co-author of Naturalizing Digital Immigrants: Collegial Coaching for Technology Integration. For many of us, it means coaching from the overflow of wisdom resulting from offering side-by-side assistance. When pondering coaching in the school setting, one of my experiences has been a focus on a more non-technology approach. Some point out that this type of mentor model remains a technology-less experience. Few models encourage technology use, whether to facilitate coaching or model its use to assist teachers or administrators. 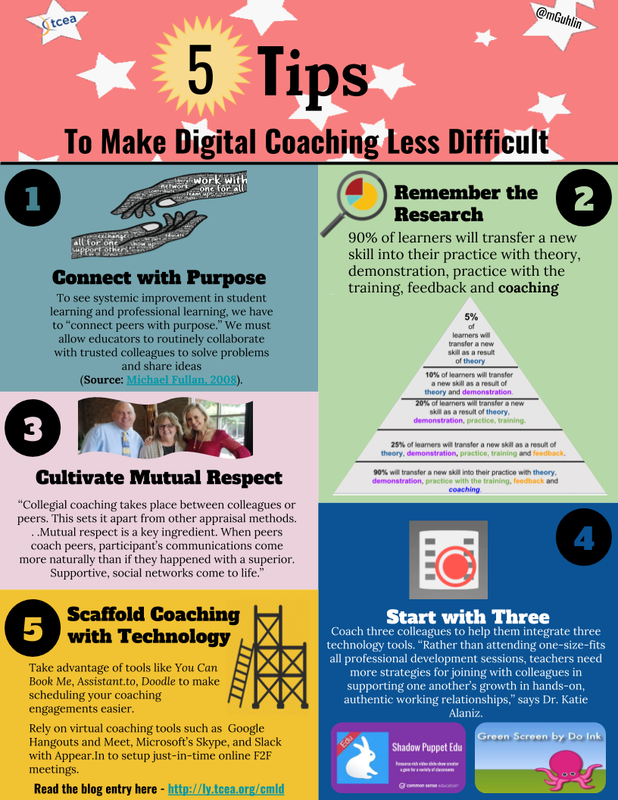 Let’s explore some key ideas relevant to digital coaching. Effective professional learning is intensive, ongoing, focused on the classroom, and occurs during the teacher’s workday (Darling-Hammond, 2009). To see systemic improvement in student learning and professional learning, we have to “connect peers with purpose.” We must allow educators to routinely collaborate with trusted colleagues to solve problems and share ideas (Source: Michael Fullan, 2008). Teaching can be a solitary occupation. Although many schools have embraced professional learning communities (PLCs) for collaborative planning to ensure adherence to a district path to state-mandated curriculum standards, teachers can often feel isolated. Let’s explore some key ideas about the power of coaching to address this. These perceptions of isolation can be overcome with collegial coaching efforts.”With the guidance of a coach, teachers can leverage the power of technology to engage students in their learning and help them develop digital age skills,” says ISTE Standards for Coaches. Dr. Katie Alaniz, co-author of Naturalizing Digital Immigrants: Collegial Coaching for Technology Integration with Dr. Dawn Wilson, shares the following insight from her work. Key concepts are paraphrased below. Listen to the complete audio recording of Dr. Alaniz. Students are required to coach three colleagues to help them integrate three technology tools. It is absolutely incredible to witness…the confidence boost for teachers who are having trouble. . .this is key. Collegial coaching takes place between colleagues or peers. This sets it apart from other appraisal methods. . .Mutual respect is a key ingredient. When peers coach peers, participant’s communications come more naturally than if they happened with a superior. Supportive, social networks come to life. Collegial coaching offers an alternative to the more traditional approach. What’s more, it removes the fog of psychological isolation that can demoralize and harm teachers’ forward progress. Two years after receiving coronary bypass surgery to save their lives, 90 percent of patients are back to old behaviors – Dr. Edward Miller, John Hopkins University. 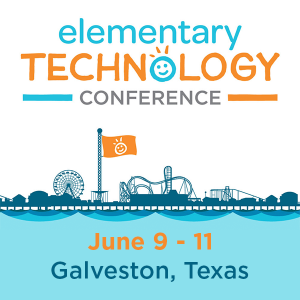 “Rather than attending one-size-fits all professional development sessions, teachers need more strategies for joining with colleagues in supporting one another’s growth in hands-on, authentic working relationships,” says Dr. Katie Alaniz. We do not change alone. We must make change possible in three dimensions: 1) personal; 2) social and 3) structural. Bringing about change involves adopting new skills and approaches. Setting clear expectations and outcomes. Coaches that adopt these skill sets empower educators to change. As you can see, this type of approach goes beyond two people building a collegial relationship. It involves addressing the six sources of influence represented in Influencer. If coaching is more than just about a charismatic coach and willing participant, logistics plays a key part in the change effort. Below are two tips that describe ways that technology can provide assistance to coaches. Want to enable your coaches to schedule meeting times with you on their own? Take advantage of one of these Google/Microsoft calendar-friendly tools to enable others to schedule themselves. Make sure that you schedule your time as well. Don’t forget to set aside time for travel, lunch, and office time. Once others know they can book you for just-in-time support, they will be eager to take advantage of you! You Can Book Me: Provides a variety of scheduling features to make setting up meetings easy. Assistant.to: This is a Chrome extension that integrates with Google Calendar, letting you schedule meetings right from your compose window. Doodle: Doodle offers a selection of solutions that simplify scheduling appointments. Choose what’s right for the situation. Text-based tools work for conveying information, but not much else. Video may work well but be distracting in certain situations. Audio works well. Find a place that is private and minimizes distractions so you can both focus. As coach, manage the time of the virtual coaching session. Some tools that work include Google Hangouts and Meet, Microsoft’s Skype, and Slack with Appear.In. 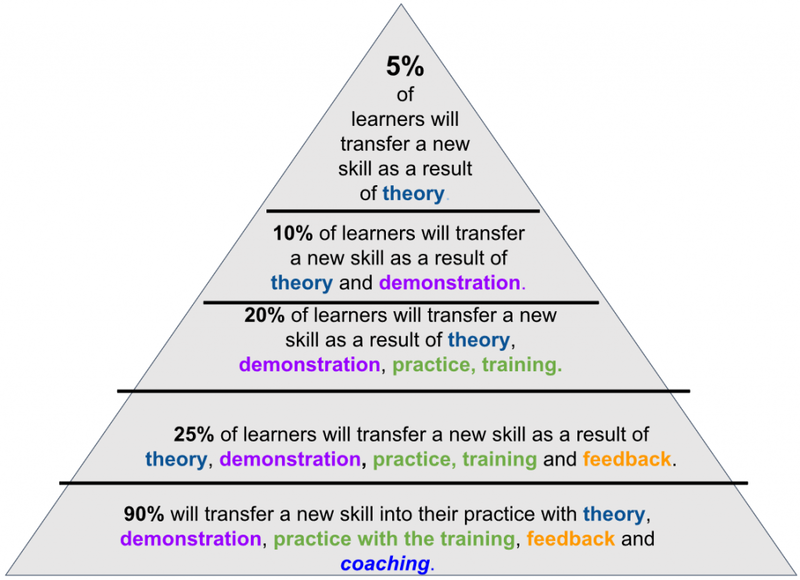 Ready to learn more about coaching models? Many of us imagine the process of helping another educator to be quite straightforward. Coaching, though, is more than just showing or telling people how to do things. 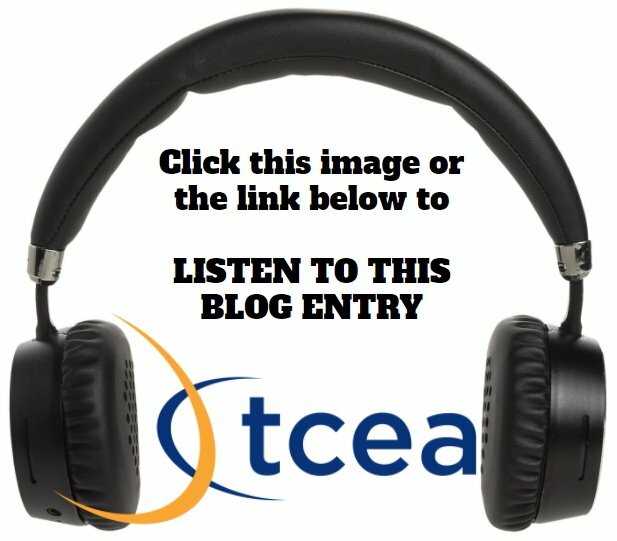 While collegial coaching (briefly touched on in this blog entry) is one approach you can learn about that blends technology into coaching, there are others available. 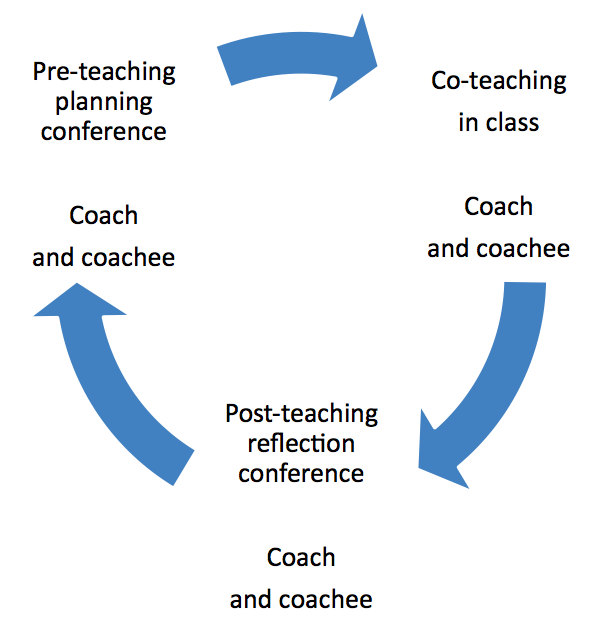 Results Coaching is one model that is in use in Texas districts. Dr. Elena Aguilar’s book, The Art of Coaching, also provides guidance and insight. Jim Knight’s work, Instructional Coaching: A Partnership Approach to Improving Instruction, is also recommended.